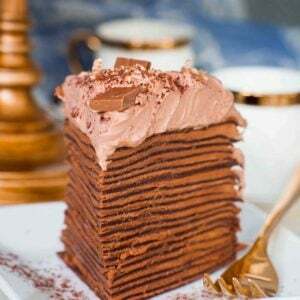 Coffee lovers – this extravagant cake is for you! 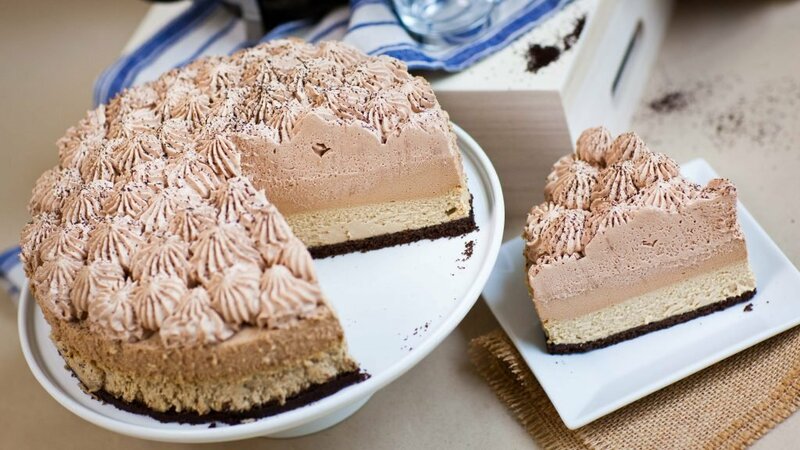 My ‘Triple Coffee Cheesecake’ is a combination of Kahlua cheesecake, Kahlua-coffee mousse, topped off with coffee-chocolate whipped cream. All three layers come together to form a gorgeous, show-stopping cake that literally melts in your mouth. I love that this cake isn’t too sweet; it’s rich and flavorful, yet not overwhelming. This is one of the best cheesecakes I’ve ever had – definitely one to try! Watch my video recipe for step-by-step instructions! Want new recipe updates? Make sure to subscribe to my YouTube channel to get new recipe updates! 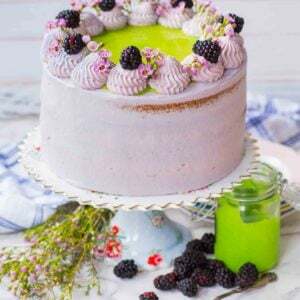 I’ve made this cake over and over again for many different occasions and it’s always a hit with everyone! Enjoy it for birthdays, anniversaries, or other special occasions. My dad now requests this cake all the time and has my sister make it for him and his coworkers! I love this close up shot of a slice! The layers are so beautiful and distinct! This cake is ALMOST too pretty to eat! If you enjoyed this recipe, save it to Pinterest for later! Prepare the Kahlua coffee cheesecake layer first. Wrap a 9-inch spring form with foil in preparation for a water-bath. Preheat oven to 325F. Place chocolate graham crackers into a food processor and pulse into fine crumbs. Add the melted butter and pulse again until crumbs are well coated. Transfer the crumbs into spring form pan and press firmly into the bottom of the pan, creating an even and firm crust; set aside. Place the softened cream cheese into a mixer bowl with a flat beater attached. Mix for 5 minutes, until cream cheese is light and creamy. Add the eggs, sugar, sour cream and softened mascaprone; beat again for a few minutes until mixture is smooth. Scrape down sides of mixing bowl periodically to ensure no clumps of cheese remain. 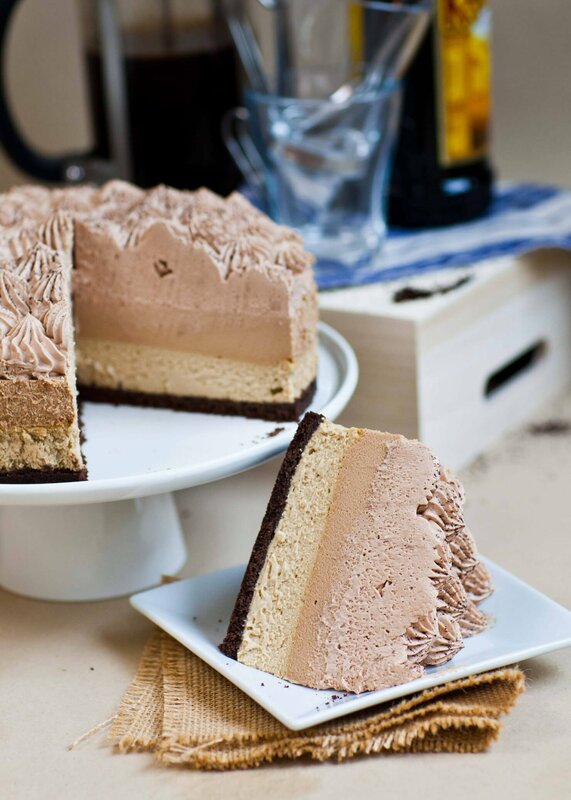 Dissolve the instant coffee in the Kahlua liqueur, then pour into the cheesecake batter. Mix for a few more minutes. Pour the cheesecake batter over the prepared chocolate crust. Transfer the cake onto a baking sheet and fill the pan with hot water. Bake in preheated oven for 1 hour and 5 to 15 minutes, just until the top is set. Once cheesecake is baked, remove from oven and allow it to cool for one hour before adding the next mousse layer. Prepare the coffee mousse layer. Pour cold heavy cream into a mixer bowl and whisk until stiff peaks form; set aside. In a separate bowl, cream together the softened mascarpone, sweetened condensed milk and melted chocolate. In a measuring cup, combine the espresso, Kahlua and unflavored gelatin. Heat this mixture in the microwave for about 1 minute, or until the gelatin is completely dissolved; cool for 5 minutes. Pour the gelatin mixture into the creamed mascarpone and stir until combined. Add the whipped cream and fold gently with a spatula until well-combined. Fold as gently as possible to keep the whipped cream airy. Pour the mousse over the cooled cheesecake and set into the refrigerator to set for 30 minutes up to 1 hour. The top of the mousse should start to firm up before adding the last layer. For the coffee-chocolate whipped cream, place softened cream cheese, melted chocolate, Kahlua, and a pinch of salt into mixer bowl. Whisk for a few minutes until creamy and smooth. 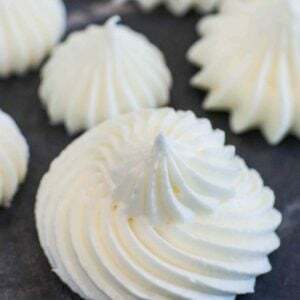 Pour in the cold heavy cream and whisk until a thick and fluffy whipped cream forms. Transfer the whipped cream into a pastry bag; I used tip #4FT - French star tip. Pipe the whipped cream in layers over the mousse. 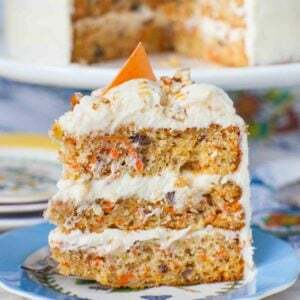 Alternatively, simply spoon the whipped cream onto the cake and smooth the top. Place the cake into the refrigerator and set overnight. To remove the cake from spring form, run a flat spatula along the edges to release the cake. Keep cake refrigerated until ready to serve. I was wondering if all the cheese ingredients and sour cream should be room temperature? What about the heavy cream as well? Heavy cream should always be chilled. For best results chill beaters and bowl. :)) Awesome! So glad you enjoyed it! It’s one of my new favorites, too! Couldn’t stop eating it! The recipe doesn’t say when you add the melted chocolate chips for the chocolate coffee whipping cream. I don’t normally feel compelled to leave comments or reviews, but this recipe is an exception. What a delicious cheesecake! 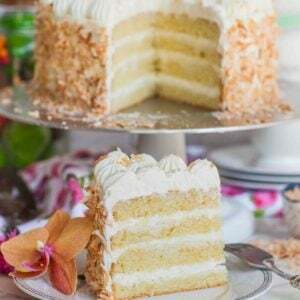 It’s light and fluffy, and while each layer has its own distinct flavor they each complement the others well. I didn’t have Kahlua on hand, so I brewed some strong coffee, sweetened it, and cooled it. I used this each time the recipe called for espresso and Kahlua. The result was pleasing, but I suspect using Kahlua and espresso is even better. Thanks so much for sharing this! 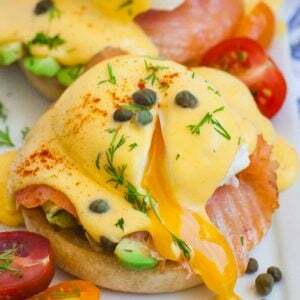 Is there a substitute I can use for the eggs in this recipe? Is there a substitution for the kahlua? Could I just use more espresso?